As much as I like to cook, eating out and tasting the flavors other good cooks put together is inspiring and wonderful...I have actually stopped on my way past an open restaurant door to breathe in the tempting food fragrances...beckoning me to come in, sit down and eat. If a menu includes a great selection of lunch-time sandwiches, I can honestly say, I would never order tuna or chicken salad...too many restaurants use light tuna, which I think is glorified cat food; some also use a poor quality mayonnaise...or...Miracle Whip...which I do not consider a true mayonnaise, at all. I might, however, order a Reuben sandwich even though I know that the beef could have too much fat...the sauce might be too lavish and the cheese non-existent...but, it could be good...a great Reuben is a joy to consume. The last one my husband and I ordered was so thick with lean, tender slices of corned beef, we could only eat half of each sandwich. Ahhh...what a way to go! On the home front, I usually make our own Reuben sandwiches the day after we have our St. Patrick's Day corned beef and cabbage dinner...I buy extra meat just so I can make the sandwiches...two favorite meals, back to back...now, that is a happy thing. Spread margarine on outside of each bread slice and lay, buttered side down, on a plate or waxed paper. Layer as follows: cheese, beef, kraut, dressing (spread over kraut), beef, cheese. Top with second bread slice, butter side up. Heat griddle, med-high. Place sandwich on griddle and grill until browned and cheese is melted; flip sandwich carefully and grill side two. Remove to plate, cut in half. Serve. Sides: Slaw (post #10), fries, fresh fruit, dill pickle. * 21 Seasoning Salute is a wonderful, salt-free product from Trader Joe’s. It contains the following ingredients: onion, pepper, celery seed, cayenne pepper, parsley, basil, marjoram, bay leaf, oregano, thyme, savory, rosemary, cumin, mustard, coriander, garlic, carrot, orange peel, tomato granules, lemon juice powder, oil of lemon and citric acid. Food Memories. 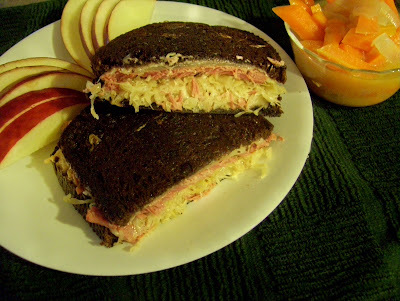 Reuben Sandwich with Russian Dressing -- I've never had the Russian dressing, but it sounds very good, and we love reuben sandwich. Definitely interested to try this one!